The natural instinct to head to higher ground when faced with rising water isn’t limited to humans. Horses, too, have an apparent determination to escape to dry ground, be it to a hill, slope or even a rooftop. 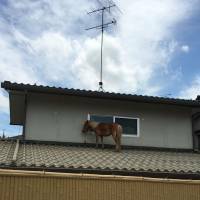 Leaf, a 9-year-old miniature mare was found stranded on a roof Monday in the Mabicho area of Kurashiki, Okayama Prefecture. 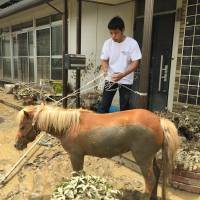 Torrential rain in western Japan forced the horse to flee, and separated her from her young colt, Earth, in the process. And getting her down from the roof was hardly straightforward. A rescue team from Peace Winds Japan (PWJ) — a nonprofit organization engaged in disaster-relief activities in the affected area — found Leaf while on its way to a school that has been functioning as an evacuation shelter. 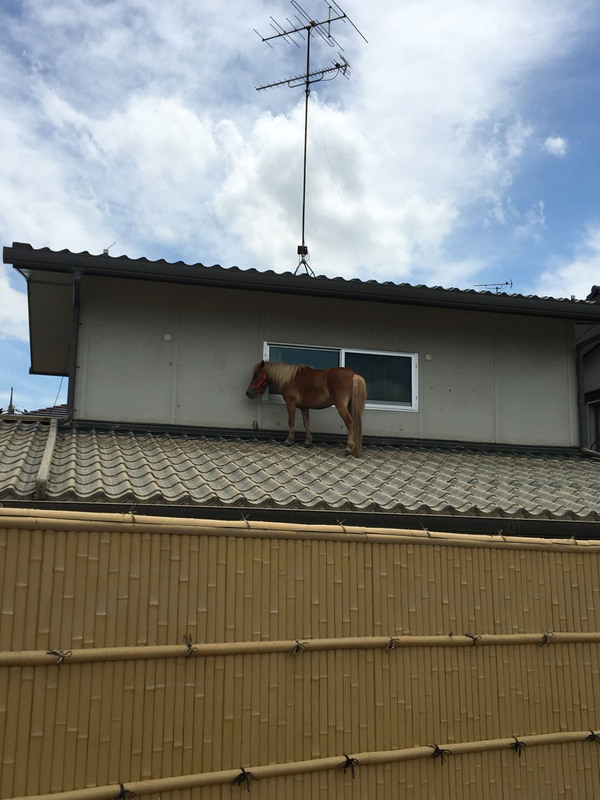 While the team sought additional help, the mare fell from the 2-meter-high roof to the ground, landing on her torso. She was immediately comforted by the PWJ team and escaped any serious injuries. But Earth, who is less than a year old, remains missing. Local evacuees have since come by to see Leaf, and to feed her carrots and cabbage, according to a PWJ staff member. 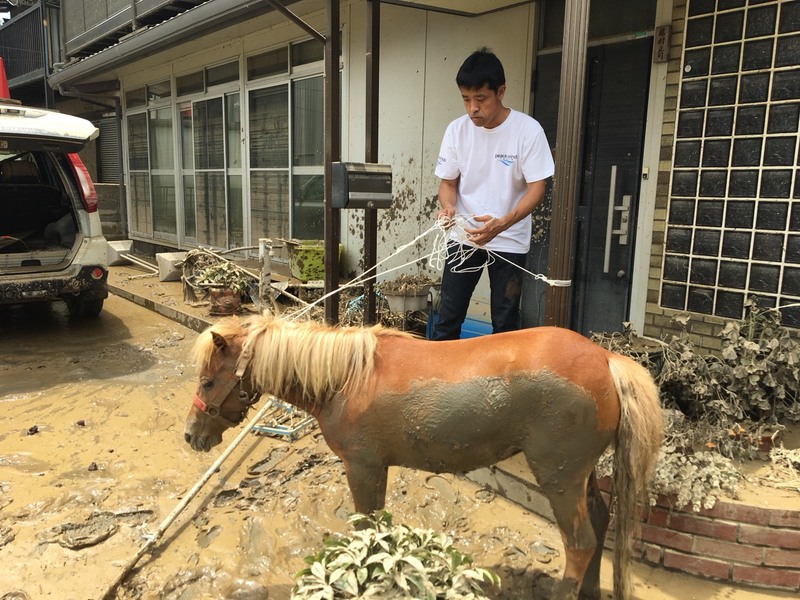 Leaf was later reunited with a Mabi Farm Kakehashi staff member who had been compelled to release her and her colt when floodwaters swept through the area last Friday, forcing an immediate evacuation of all residents. The mare is now being taken care of at another farm whose staff members often work with Mabi Farm, which was severely damaged by the floods and rain. Horse lovers and local residents are now posting pictures of Earth on Twitter, calling for anyone who may have seen the colt to share information and help to reunite the two horses. Twitter account @asami0123, who identifies herself as a big fan of horse racing, tweeted on Monday, “I hope this baby, Earth, is still alive somewhere” with the picture of the colt. PWJ is not officially asking for any information regarding the missing colt, but spokeswoman Keiko Takahashi said the organization is encouraging local citizens to post any information or potential sightings of Earth on social media.